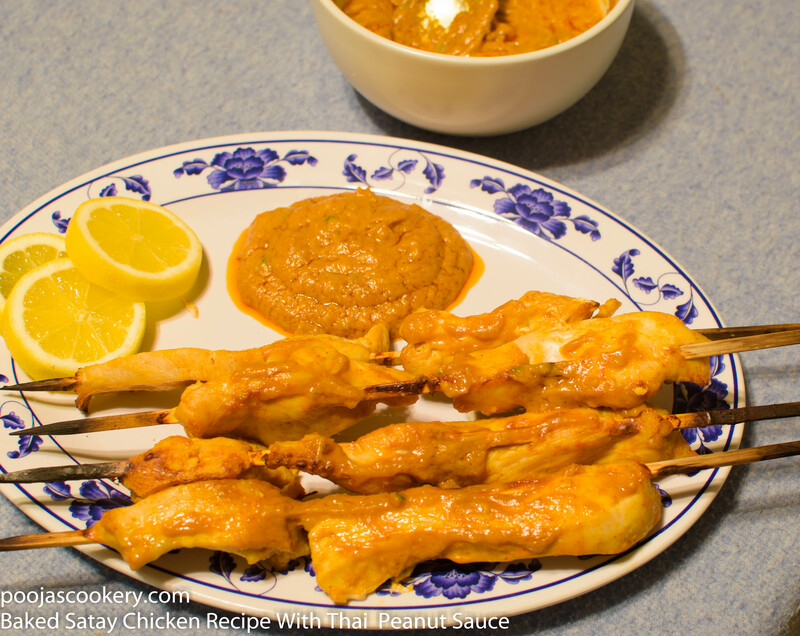 Baked Satay Chicken Recipe is same as the traditional satay chicken. If you are health freak, you must try out this yum recipe. Satay is a dish of seasoned, skewered grilled meat, served with Thai Peanut Dipping Sauce. It is a popular dish in Indonesia. They are sold by a travelling satay vendor, a street side tent restaurant or in an upper-class restaurant. In Malaysia, Satay is very popular, especially during celebrations. It is also called as Satti in Southern Philippines. 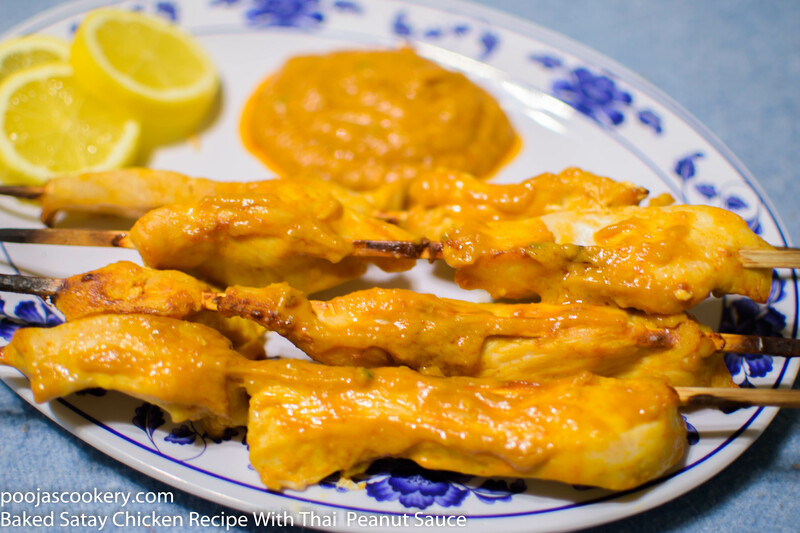 In this Thai style Satay, the chicken is cut into big thick strips lengthwise and then pre marinated with Different sauces and then threaded on the wooden satay skewers. They are then grilled over fire. Thai peanut dipping sauce gives it extra taste and flavor. 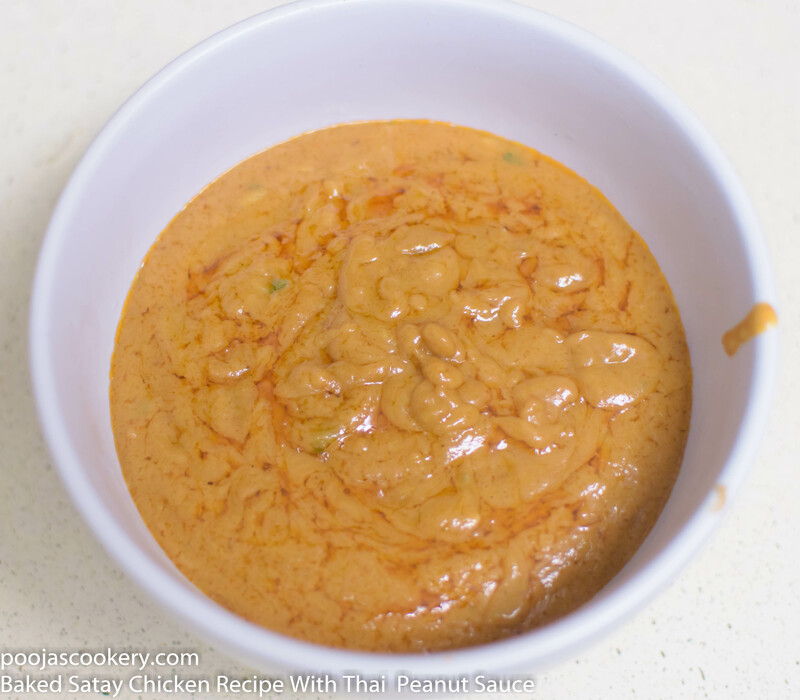 Peanut sauce can be prepared ahead of time and can be refrigerated and used whenever needed. The recipe for the sauce is very easy . Though Satay is grilled, I have prepared baked version of it. You can also grill if you like. So why go to restaurants and waste money when you get the same authentic taste of Satay at home? Wash and cut the chicken lengthwise into 1 inch thick strips. Measure it . In a bowl, whisk together, ingredients mentioned in marinade and marinade chicken strips for about 30 minutes. In the meantime, let’s see how to prepare peanut sauce. In a saucepan, combine together , the ingredients mentioned for sauce, excluding lime juice. Heat it up on medium heat, stirring occasionally, for about 5 minutes. Remove from heat, stir in the lime juice and pour it in a separate bowl. Allow it to cool. Let’s assemble chicken to go into the oven. Wash the skewers well. Wipe them dry and thread 1-2 pieces of chicken strips lengthwise onto each skewer. Arrange the skewers on a baking tray lined with silver foil as shown in the picture below. Bake them for about 20-30 minutes. Then broil for about 5 minutes for the texture. This is optional. Transfer the skewers on a serving plate. Drizzle the peanut sauce on top or serve it separately in a bowl as a dipping. In the meantime, let's see how to prepare peanut sauce. Let's assemble chicken to go into the oven.